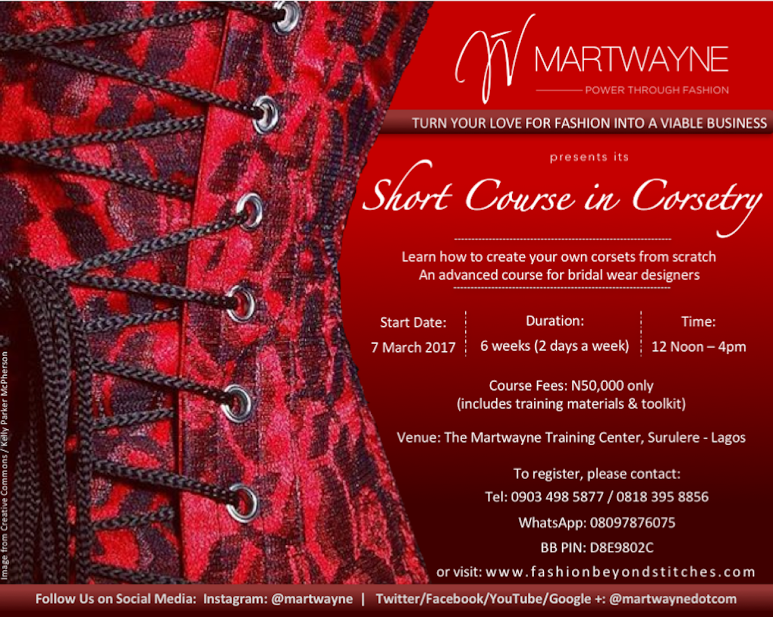 We have amazing fashion courses coming up at Martwayne. Now is the opportunity to develop your inner creativity and earn an extra income! Think about it, if all you have been doing so far is just sewing for people, how about learning how to design your own fabrics, selling them to your customers and creating a new stream of income? After all, aso-ebi is still huge despite the recession. OR better still, learn how to create beautiful fashion sketches and sell your designs to your colleagues for those stunning aso-ebi creations. I'm sure you must be tired of people giving you magazines to copy all the time. Trust me, it becomes tiring and it literally kills your creativity. 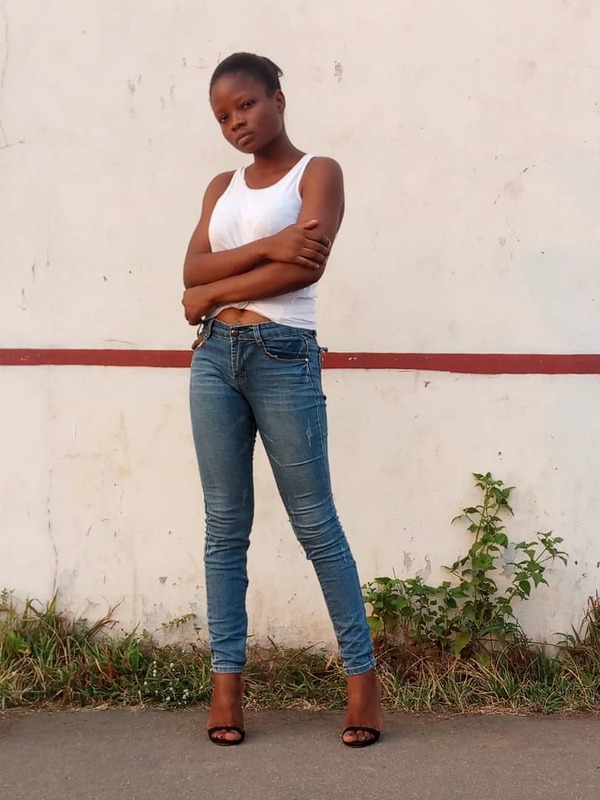 PLUS if you still have a 9-5 but love fashion, you can start making the money now by turning your love for fashion into a viable business at Martwayne. Learn Manual and Textile Design. Modules include "know your fabrics & what they are used for", embroidery, beading, fabric painting, weaving, appliqué, tye and dye, fabric painting & textile design with a design software. Perfect for Beginners and those who already run fashion businesses. There is a weekday option starting 7 March, 2017 (Tuesdays & Thursdays) and the weekend option starts 11 March 2017. The manual option lasts 6 weeks and the digital option is an additional 3 weeks. 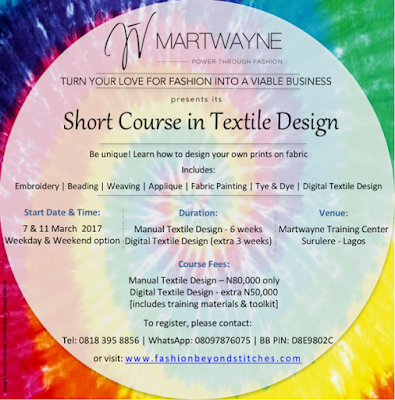 Fees are N80,000 for the Manual Textile Design and an extra N50,000 for the digital textile design if you have your tablet. Oh this is creativity at its height! Learn how to design your own clothes, about colors, fabrics and how to draw ALL from scratch and how to edit your designs using CAD. Go from novice to PRO! Build your own fashion portfolio so your customers can pick from your designs rather than giving you magazines to copy. You can also start your own clothing line by learning how to create stunning fashion collections or simply sell your designs to fashion designers to earn income. This is a new buzzing field in the fashion industry and now is the time to make your mark! And it is perfect for beginners and practising designers. 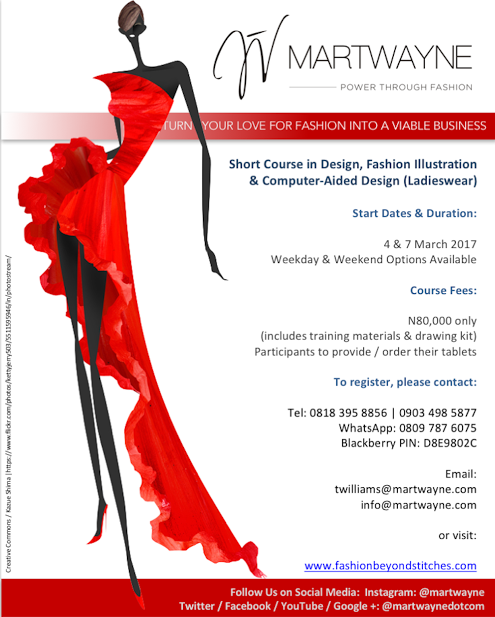 The weekend option starts 4th of March, 2017 while the weekday option of the Fashion Illustration with CAD course starts on the 7th of March, 2017. Course Fees are N80,000 for the full Course if you have your tablet. The Fashion Illustration with CAD option only is N65,000 if you have your tablet. Both options include your training materials. Duration is 8 weeks for the full Course and 6 weeks for the weekday option of the Fashion Illustration with CAD. Eveningwear & Bridalwear, this one is for you! Know those beautiful wedding gowns with structured bodices you see and love?! YES! Those are built with corsets! Wouldn't you love to create your own masterpieces and earn a premium on your work? 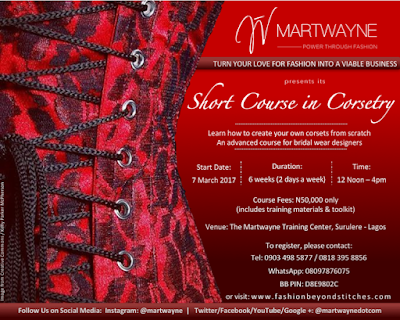 Corsetry is an advanced skill and you should add it to your portfolio! And we will even throw in lace moulding as well. But this Course is only for people who can already sew. Course fees are N50,000 only and this includes your training materials. Only the weekday option is available for now and it starts on the 7th of March, 2017. Duration is 6 weeks, 2 days a week. To reserve your seat on any of these Courses, simply pay the fees by cash or online transfer into our "Martwayne Limited" account, 023 710 3843 at any GTBank branch. You can also click on this link or visit www.fashionbeyondstitches.com for more details. All classes take place at our Training Center in Surulere, off Alhaji Masha Road, Lagos. You are welcome to visit ahead of time to be sure we are genuine. But don't worry we are. Just check us out on Instagram @martwayne. PS. Only the Corsetry class is a Sewing class. If you are interested in our Beginners or other sewing classes, please click here . Thank you so much! We look forward to welcoming you onto any of our Courses.